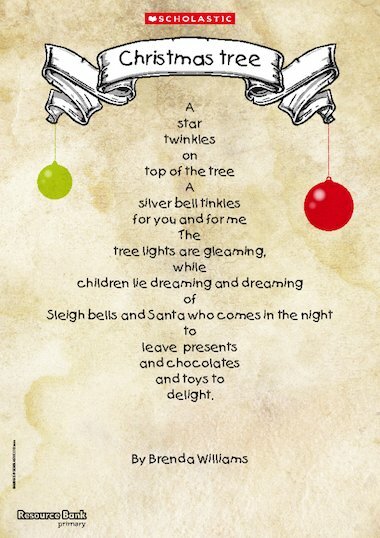 Celebrate Christmas with this lovely shape poem. I think that I shall never see A poem lovely as a tree. A tree whose hungry mouth is prest Against the earth’s sweet flowing breast; A tree that looks at God all day, And lifts her leafy arms to pray; A tree that may in summer wear A nest of robins in her hair; \ Upon whose bosom snow has lain; Who intimately lives with rain. Poems are made by fools like me, But only God can make a tree. i love this site because i hade to do a project for school and your site saved me….......thank you!!! !